Keeping in mind of the diverse and growing demands of clients, we are providing a qualitative range of Colored Corrugated Boxes. 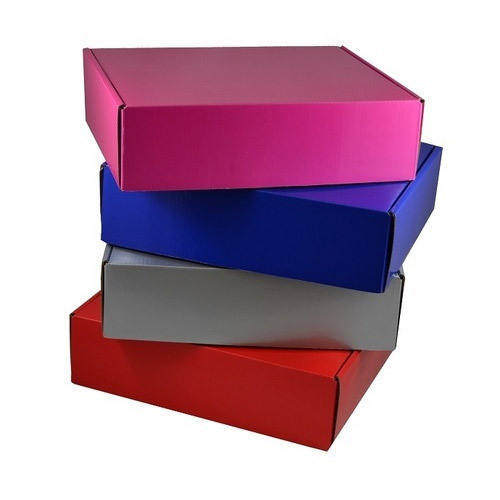 Our offered Colored Corrugated Boxes are the perfect blend of durability and heavy load bearing capacity. These products are properly laminated and widely used for the safe transportation of products from one place to another. One can avail these products in various standard sizes and color combinations. Fine Packaging Co. was incorporated in the year 1998. Our original mission was to manufacture and supply corrugated packaging to the ever growing Indian market. In 1990 the company established a manufacturing unit at IDA Balanagar, Hyderabad. Early in the 1990's the company recognized a trusted name among customers as a dependable source of supply. The corrugated packaging industry had always been one driven by production requirements. Our company’s management recognized that the requirements of the supplier had very little to do with the needs of the customer. Fine Packaging Company then initiated the concept of 100% "on time" delivery by which customers could now have the speed of delivery. This may very well be accomplished because Fine Packaging Co. had actively pursued the idea of "overcapacity". Overcapacity allows us to provide product in a more time period sensitive manner. Note: We are dealing in bulk with minimum order quantity of 1000 pieces only.